Identified with the mythology of various cultures, some of them the dragon is a kind of God who possesses certain qualities, among which stands out his great spiritual power. Are common tattoo designs of dragons and you can see the evolution of these have gone through over the years, no longer the simple green dragon expelling fire from his mouth, to become in some cases a work of art. 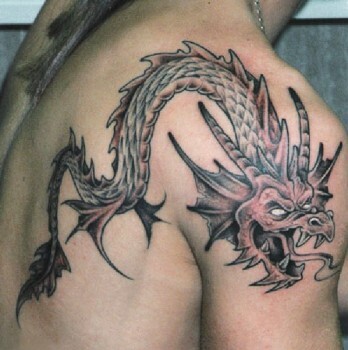 That is why we ask what is the significance of dragons and why so many people looking to have a tattoo on his body. We thus find that China is perhaps the region whose history is more linked to the story of dragons, as these creatures make mastering the four elements: earth, water, air and fire. Chinese dragons provide security both in person and at home, many choose tattoo designs then this type of thinking that will attract good luck. The dragon also represents the cycle of life and death, while the birth and renewal, but other accounts attributed other meanings, such as deception, wisdom, adventure and creatures that symbolize the good and evil. The designs are varied, the traditional image shows a large reptile species with a forked tongue and whiskers, with many different colors and backgrounds.